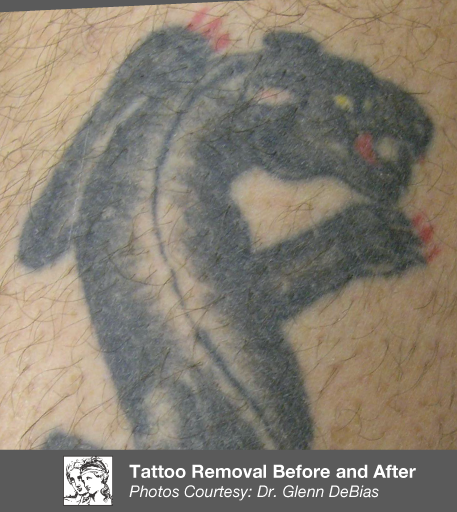 Laser Tattoo Removal is a safe and effective approach to reducing the appearance of unwanted tattoos on your body. Dr. Glenn DeBias and The Institute have been performing procedures since 1998, utilizing state-of-the-art laser technology, to help patients obtain their aesthetic desires and needs. Individual results may vary depending on a number of factors. While certain pigments and inks are more difficult to remove, the majority of colors can be removed, including black, blue, green, brown and even red. During your consultation, Dr. DeBias will give you an honest assessment of what to expect and what is attainable for your tattoo removal needs. Dr. DeBias and his exceptionally trained staff have performed over 250,000 aesthetic procedures to date with high patient satisfaction. A combination of depth of knowledge, best technology, most experience, and an artistic talent ensure optimal patient results and outcomes. Visit The Institute for Laser and Aesthetic Medicine and experience a more refreshed appearance!